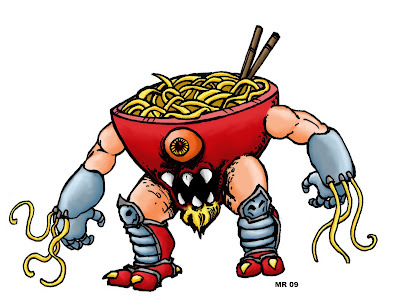 Not quite a tsukumogami, but close - instead he is a disembodied alien spirit called forth from the void by his evil alien overlords to destroy mankind... it just so happens the engine of destruction that was chosen for this task was a bowl of Ramen noodles. We wish him luck with that. Inspired by the Noodle Jingin from Choujin Sentai Jetman.